Haq's Musings: India-Pakistan Lovefest or Sledge Match at Mohali? 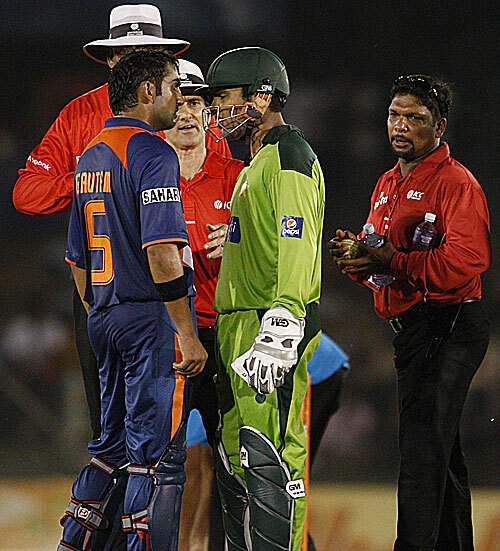 India-Pakistan Lovefest or Sledge Match at Mohali? Cricket was considered a gentleman's sport until the Australians invented sledging, defined as words or phrases designed to upset opponents to gain a competitive edge in crunch matches. Though Aussies still remain the king of sledge, Indians and Pakistanis are also known to engage in this coarse practice when emotions are running high. But somehow, they tend to get in trouble more often than their Australian counterparts. In a 2008 encounter between India and Australia, Indian bowler Harbhajan Singh was disciplined by the ICC when Australia's Andrew Symonds accused him of using a racial slur. Upon further investigation, it turned out that Singh said to Syomnds "teri maaN ki c---" (Your mother's c---) which Symonds heard as "monkey". The Harbhajan-Symonds incident implies that there are some rules for sledging that permit verbal salvos against the character of women in the players' lives, while prohibiting any race-based verbal attacks. It also appears to imply that misogyny is permissible on the male-dominated cricket field but racism is not. Given this background and their common language, it's quite possible that both Indians and Pakistanis will freely offer their unflattering opinions of each others' female relatives at the upcoming World Cup semifinal at Mohali on March 30, 2011. Among the most quoted sledges is this one about Australia's Rodney Marsh and England's Ian Botham: Marsh: "How's your wife and my kids?" Botham: "The wife's fine; the kids are retarded." Not all sledges relate to females. The one reported about Pakistan's Javed Miandad and Australia's Merv Hughes goes like this: Javed Miandad called Hughes a fat bus conductor during a match. A few balls later, Hughes dismissed Miandad. “Tickets please,” said Hughes, as he mocked the departing batsman. Regardless of sledging and match results, I do hope that the high-energy, high-emotion India-Pakistan encounter in Mohali offers a great spectacle of fine cricket and the best possible sportsmanship the two South Asian neighbors have to offer. YOU LIKE TO STIR THE POT DON'T YOU? Actually when I visited India under the cricket match visa program, i enjoyed their kind hospitality. Many Indians felt the same when they visited Pakistan. Sledging among players aide, I think the vast majority of Indians are going to welcome Pakistani team and fans and enjoy the rivals playing each other. But it doesn't take more than a few fans to cause trouble as happened at Eden Garden some years ago. Marsh: "How's your wife and my kids?" Botham: "The wife's fine; the kids are retarded." ....Listen to the metaphors ex-cricketers are serving up to describe the epic encounter. Vivian Richards says this is "the best war that can be fought ... a war without weapons". Imran Khan insists - quite correctly - that there will be a "curfew in the subcontinent on the day of the match". He also flags up a concern: "I hope it is played in the right spirit." Khan's concern is understandable. The two sides haven't played a single match on each other's soil since the 2008 Mumbai attacks. With ties between the two neighbours plummeting, Pakistani cricketers have been kept out of the lucrative Indian Premier League after the first season. Since the attacks, the two sides have played each other only twice: Pakistan won a 2009 Champions Trophy game in South Africa by 54 runs, while India won a closely fought 2010 Asia Cup game in Sri Lanka by three wickets with one ball remaining. So the pressure on both sides playing in Indian Punjab will be enormous. And not many expected an India-Pakistan semi-final this World Cup. The subcontinental twins had been disgraced - ousted unceremoniously by minnows - in the last edition of the Cup in West Indies in 2007. And in the run up to this edition, Pakistan cricket had reached its nadir with three top players found guilty of corruption and the usual selection controversies. A team which appeared to be in a shambles has already confounded pundits and proved that they excel when in trouble. So Pakistan have won five of the six league games and decimated the West Indies in the quarter-finals.They boast of two of the four top wicket takers in the tournament: captain Shahid Afridi and Umar Gul have picked up 35 wickets between them so far. And thus, this epic battle has been literally foisted upon Indian soil by Pakistan, a rousing victory of sports over politics. No one believes that Wednesday's game will help ease relations between the squabbling neighbours despite Indian PM Manmohan Singh's cricket diplomacy. Nobody believes that it will pave the way for resumption of bilateral cricket ties, which have been disrupted in the past by wars, the demolition of a mosque, an attack on the Indian parliament and religious riots. The irony is that India and Pakistan had become quite comfortable with winning and losing as they played more frequently before the Mumbai attacks: the two sides played a Test series every year between 2003 and 2007. The honours had been even: India and Pakistan had won one series each and drawn the remaining two. "These days," wrote Indian scholar Ramachandra Guha, "Indians don't take failure as national humiliation. Perhaps they consoled themselves that the country surpassed Pakistan in all spheres. It had better scientists, better writers, a more vigorous film industry, and was a democracy besides." So who will win this "final before the final"? Though Pakistan has an overwhelming 60% win rate against India in one-day games, history is heavily stacked against them in the World Cup: it has lost all the four previous encounters with India. Imran Khan says India begin as favourites. But mercurial Pakistan could easily provide the most tantalising twist in the tail. I hope they do not play Shoaib, yes he can get wicket but can give 30 run in two over and may not get a wicket and India get the flying start and we are done. Let rest him in peace. Imran Cricket comments are like his politics may be worst. I would agree to Play Rehman and drop Wahab Riaz, , Pakistan can win and the best chance is to Win toss, bat, openers get 70 plus and above and Indianian are under pressure, than Kamrans , Younis,Misbah and Pathan can murder them. Get Tendulkar and Sehwag very early, they become all ordinary,. We are home!!!!! Austrailian were destined to loose , they did not have spinner to get wickets. When Dhoni got out if they had spinners to tighten the grip india could be in trouble.They were shaky and on the edge. Sounds like mini South Asia at work in America! I just heard on GeoTV that big screen TV sales are up and party caterers' business is booming...sort of Cricket Superbowl parties in Pakistan. Indian PM Manmohan Singh has invited Pakistan PM Yousuf Gilani to watch India-Pakistan World Cup semifinal at Mohali. The last time India and Pakistan engaged in "cricket diplomacy" was when President Musharraf was invited by PM Manmohan Singh on April 17, 2005, the match ended very badly for India. Pakistan beat India by 143 runs, propelled by Afridi's 134 runs. Riaz, tell Pakistani players that there is something called fielding too. Even as an Indian I can tell you that today we had all the luck while batting. Notice that we did not drop catches. who made you a cricket analyst. The pitch was not a batsmen's pitch. It assisted spinners and was coming slow. Scoring was always going to be difficult. Akram at TV was telling right when Pak batted that 260 is a tough score. Cannot agree more. Afridi has phenomenal leadership skills. He coaxed amazing performances out of a team without 3 top stars, and with all kinds of baggage. Too bad he's dealing with a psycho PCB. I think; Pakistan team won this round of diplomacy! harder to lose. They won! Leaving aside concerns about match-fixing, the recent history of Pakistani cricket team's performance tells us that Pakistan's only strength is in bowling which is frequently compromised by significant weakness in fielding and batting. What do u think of both articles? In 1981, Miandad clashed with Australia's great fast bowler Dennis Lillee during a Test match in Perth. Lillee, never a saint, obstructed Miandad when the batsman was running a single. The volatile Pakistani pushed the paceman; Lillee kicked at the batsman. As Australian umpire Tony Crafter played boxing referee and stood between them, Miandad raised his bat overhead, threatening to strike Lillee, who was pilloried for starting the blue. Cricketing bible Wisden described the unseemly incident as "one of the most undignified incidents in Test history". Former Australian captain, and later coach, Bob Simpson said it was "the most disgraceful thing I have seen on a cricket field". Ex-Aussie allrounder Keith Miller said Lillee "should be suspended for the rest of the season" and ex-skipper Ian Chappell said Lillee acted like "a spoiled, angry child". Lillee was initially fined $200, a wet-lettuce penalty appealed by Pakistan who threatened to end the tour without further action. So the Australian Cricket Board reduced Lillee's fine to $120 but suspended him two matches - he missed two low-key one-day internationals but played on. Lillee and Miandad continued acrimonious verbal stoushes for the rest of their careers - and the Pakistani run-scorer was again a main character in the next chapter of blow-ups between the nations. In 1988, Australia's cricketers toured Pakistan and bemoaned what they considered dubious home-town umpiring decisions and doctored pitches. Miandad is incorrectly recalled as a batsman never given out lbw in Pakistan. Fact is, he was dismissed eight times in that manner in his 86 Test knocks on home soil. But as the Australians moaned in 1988, Miandad suggested the tourists should "pack their bags and go home" - an action the Australians were considering. The Australian camp issued a statement after the first Test saying: "The situation is unacceptable and damaging to the international cricket yet nothing seems to be done." But, like Lillee years earlier, they played on. And the gripes were nothing when compared to when Australian returned to Pakistan for a 1994 tour which had everlasting consequences. Aussie spin bowlers Shane Warne and Tim May alleged then Pakistani captain Salim Malik offered them bribes to underperform in the Karachi Test; batsman Mark Waugh also went on record saying Malik asked him to underperform in a one-day match in Rawalpindi. The allegations forced the Pakistan government to conduct a judicial inquiry but the Australians refused to appear in Pakistan, instead giving evidence in Australia. The disgraced Malik became the first cricketer banned for life for match-fixing and six players, including now coach Waqar, spinner Mushtaq Ahmed and Waqar's pace partner Wasim Akram were also fined. The match-fixing controversy took the Australia-Pakistan rivalry to unheralded levels and and the cloud hung over the 1999 World Cup final between the nations.